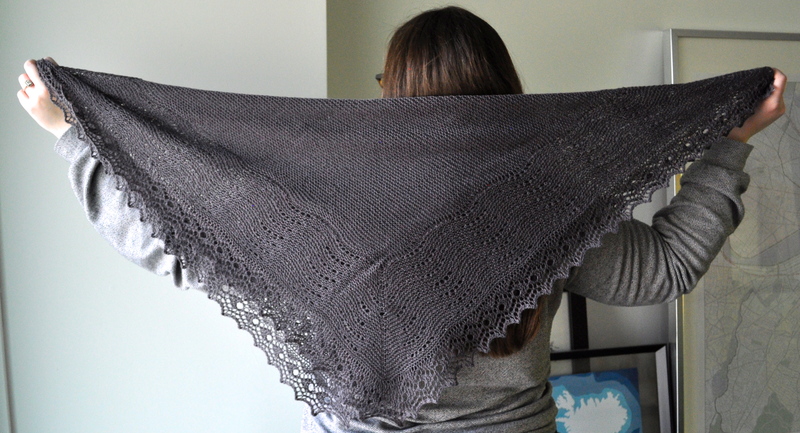 Here’s Quill (by Jared Flood) take two – a dark grey shawl just for me. 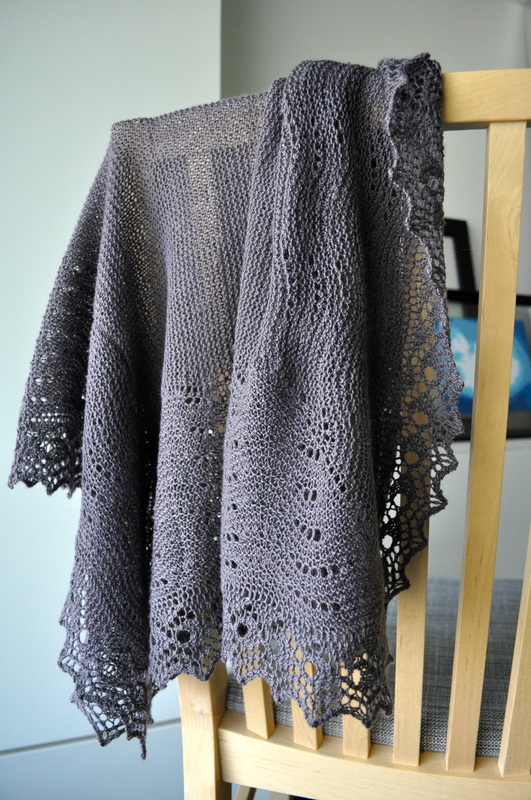 I actually started knitting this shawl before I decided to knit the Quill Baby Blanket, but put it on hold to finish the blanket in time for the baby shower. 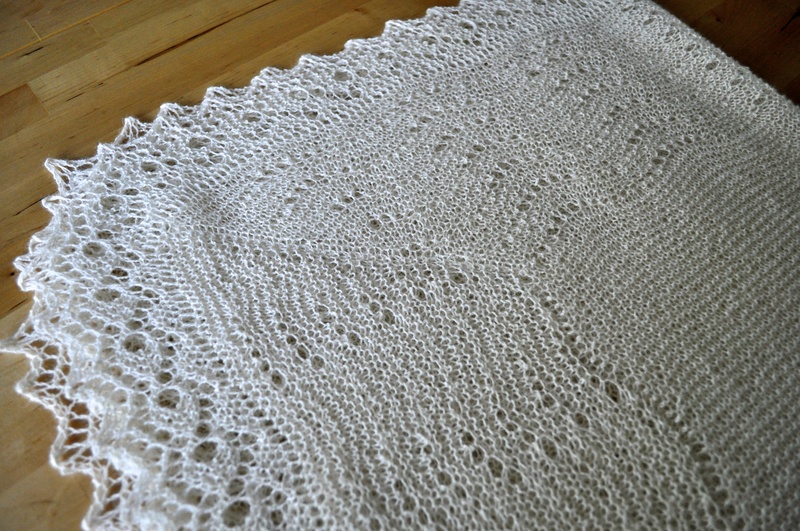 I was already well into the Old Shale lace when I decided this pattern would make a beautiful baby blanket in white, and I loved the pattern so much that I didn’t mind starting on another one right away. 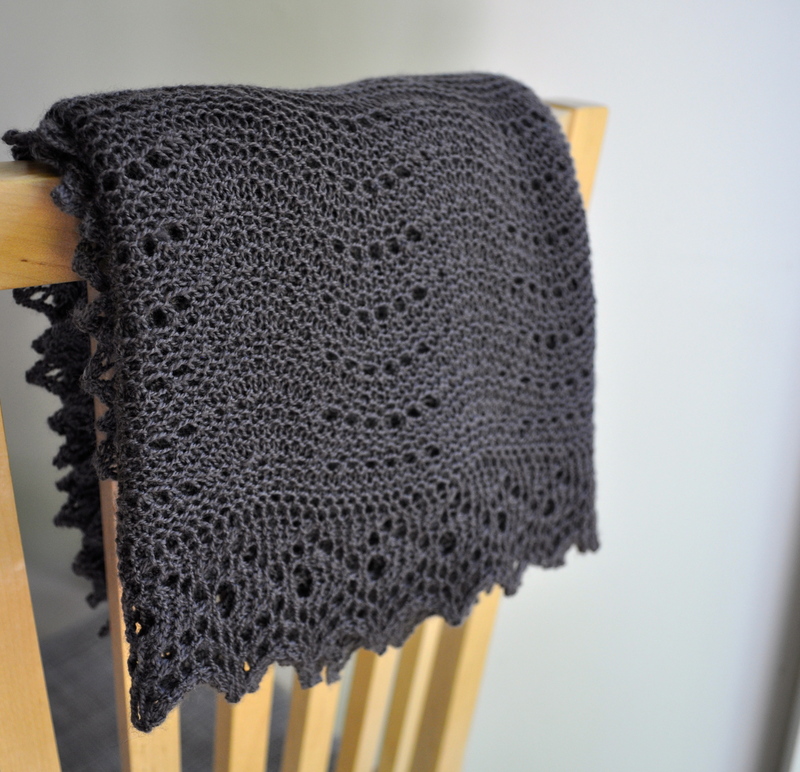 That meant a delay in finishing my own shawl, but it was well worth the wait. 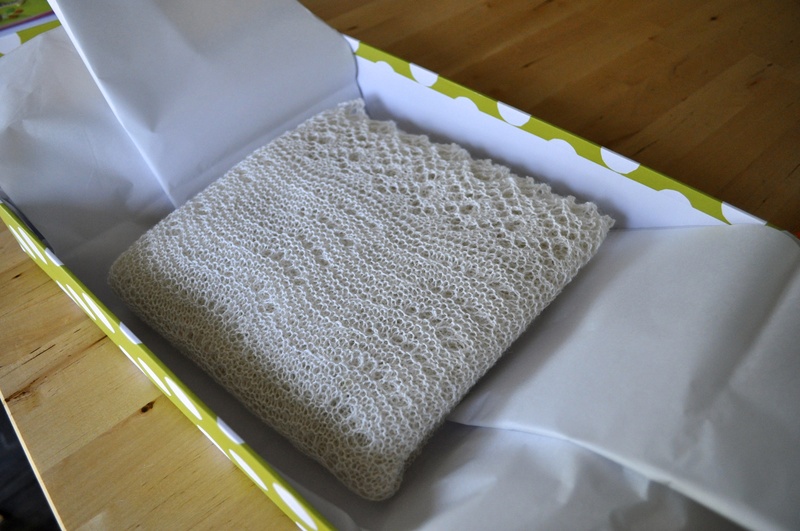 This version is knit in the lovely Debbie Bliss Rialto Lace in (you guessed it!) color number 4 – Charcoal. 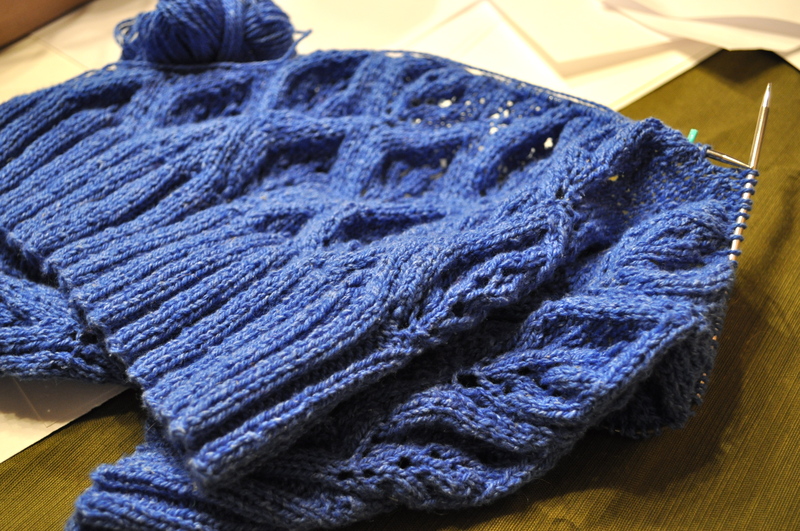 I knit this one on size 3 needles and made the small size again. I used a little bit over 2 balls of yarn – each ball is 50 g and I used 103 g (approx. 878 yds). 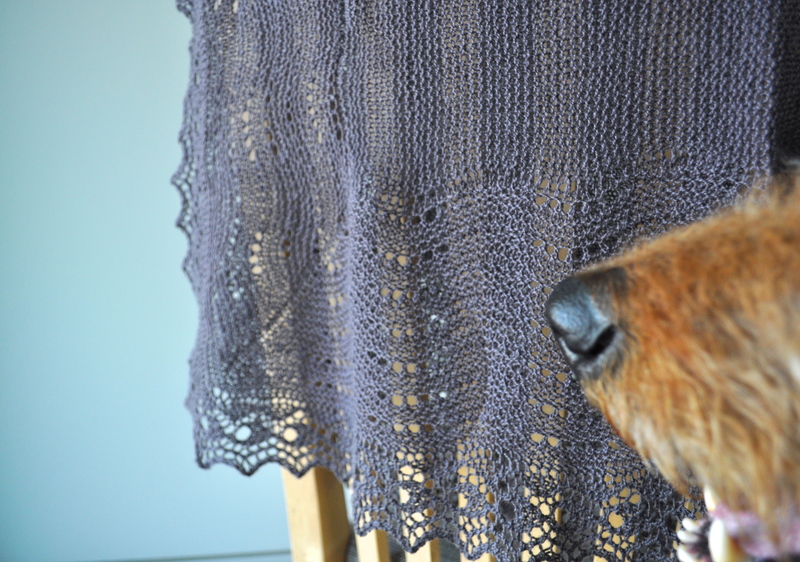 I just love this pattern – the simplicity of the Old Shale lace and the beautiful knitted-on edging. 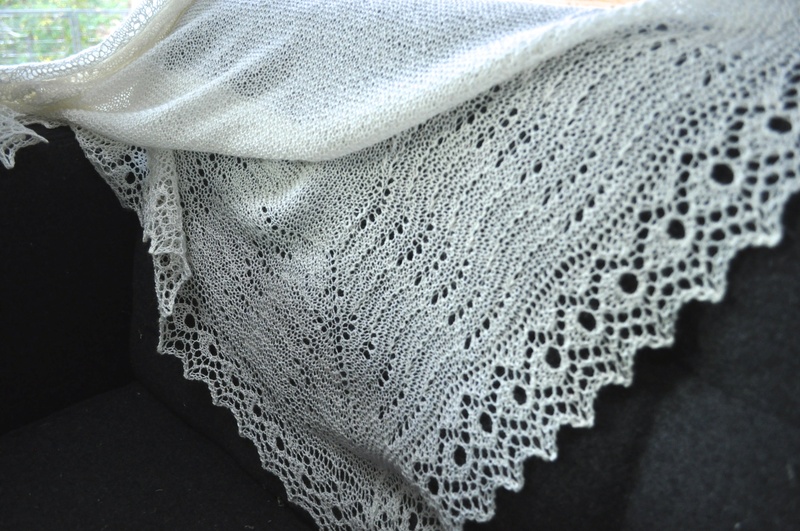 The Rialto lace is so soft, and the finished shawl has a beautiful drape and sheen. I can’t recommend the pattern and yarn enough! I was visited by an interloper during my photoshoot, so I recruited him for modeling. 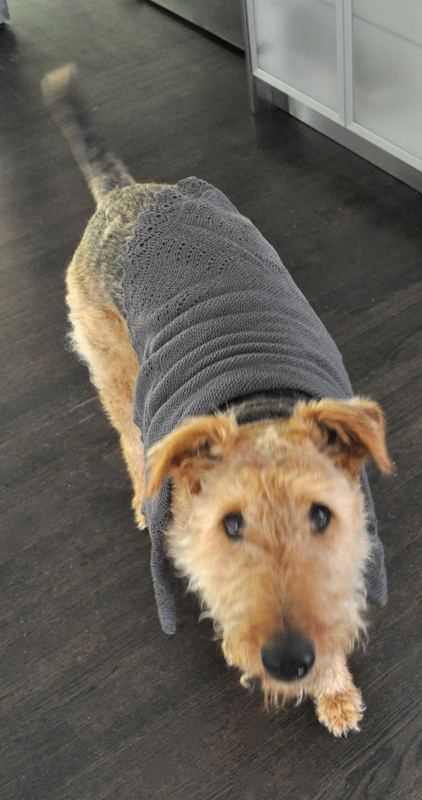 He didn’t really enjoy it. This space has been seriously neglected in recent weeks, and I only have one excuse – lighting! That’s right, I blame light for my lack of blog posts because it hasn’t been around lately for me to take pictures. I can’t make it home before it’s too dark for photos, and although it’s been sunny during the week, each weekend seems to bring back gray cloudy skies, cold temperatures and even a little bit of rain! Total bummer when you really want to take some knitting pictures to share with your friends. Since opening ceremonies for the Olympics, I’ve been working on Sabbatical by Connie Chang Chinchio (Twist Collective Winter 2009) in my Elsebeth Lavold Silky Wool from Stitches. 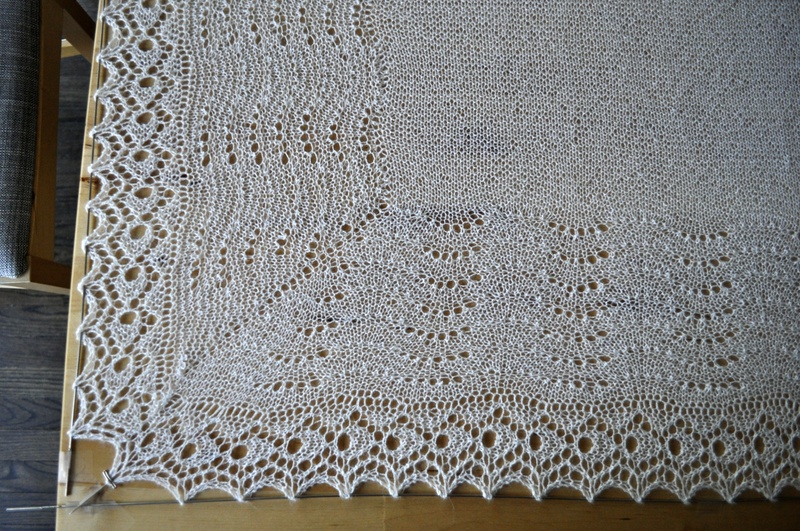 I really like the combination of the lace pattern and the yarn, but, man, is it slow going for me! 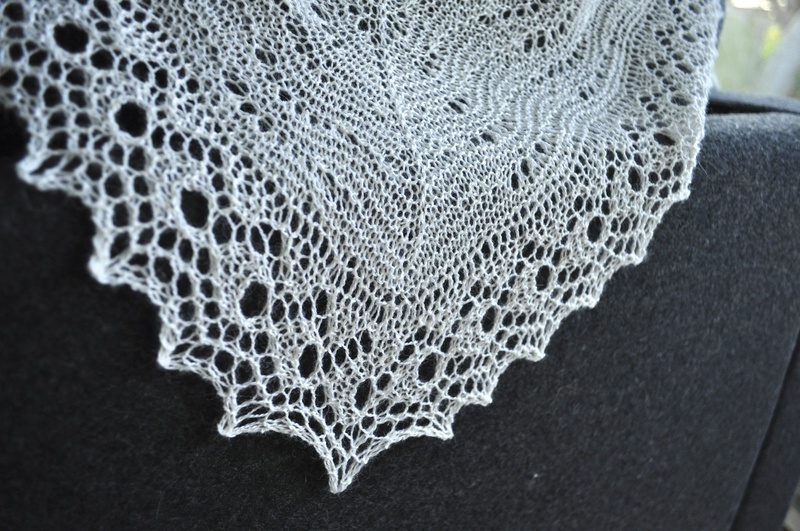 This is a pretty complicated lace pattern (you even have to think a little bit on the wrong side! ), and I’m using small needles (US 3). Combine this with the fact that I cast on the wrong number of stitches about 50 million times (ok, 4 times, but it felt like more), and the result is me only having about 10 inches of the body finished (I’m knitting fronts and back all at once) – which is way less than I should have if this project was going to be finished by the end of the Olympics. Oh yeah, did I forget to mention that I started knitting this sweater as part of the Knitting Olympics and Ravelympics? I. Am. Delusional. Despite all of my setbacks, I’m still really excited about this sweater and I can’t wait to wear it. 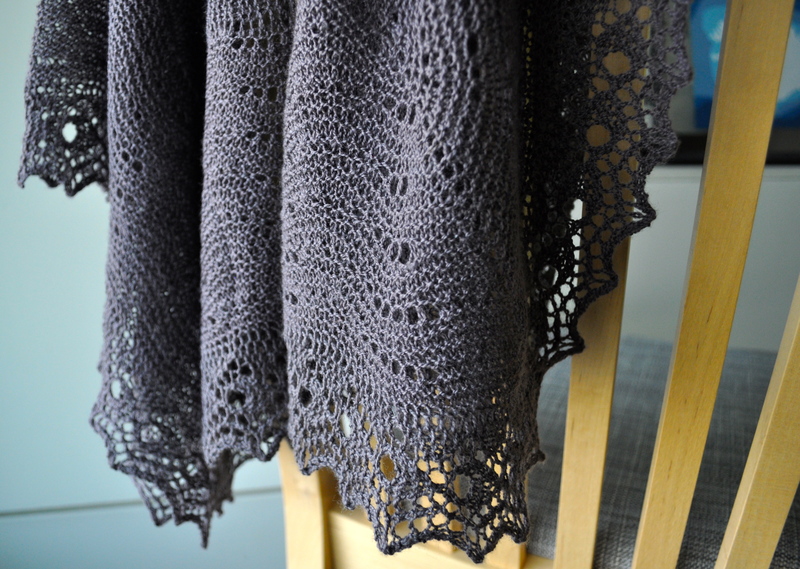 The lace pattern is gorgeous and I love the generous length. Here’s a sneak peek in the best lighting I could manage (I promise it will look different after blocking) . . .